"Your Utah Real Estate Resource"
Start outside. The first impression that prospective buyers will have of your home will be the front yard. Begin by clearing leaves and other winter debris. Cut the lawn, trim the hedges and update your landscaping for clean curb appeal. Clean ceilings and walls: As a general rule, work from the top down when it comes to wiping and dusting. Use a vacuum to remove dirt and dust from ceilings and walls, and use a solvent-free cleaner to remove grime from these surfaces. Polish door and window hardware: After cleaning windows and doors — both from the inside and outside — use liquid polish to finish the hardware on your doors and windows for a finished look. Remove and clean draperies and window treatments:Most curtains are machine washable, and all others can be dry cleaned. Wipe wooden blinds with a damp cloth, and vacuum fabric blinds. Clean furniture: Remove cushions to get rid of dust and remediate any stains. Finish by vacuuming underneath cushions and below all furniture. Dust and polish all wood furniture. Dust shelves: Remove all items from shelves and thoroughly dust these areas. Remove any clutter or personal items. Thoroughly clean floors and shampoo rugs: Wash tile floors and grout, and polish wood floors. Synthetic carpets can be deep-cleaned with a shampoo machine, but other rugs may require professional cleaning. 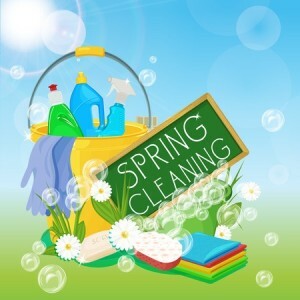 Giving your home a deep cleaning will help you spring into the home selling season with ease!